I get a lot of questions when I post fish recipes. It seems to be the one ingredient that is really hard to feel like you can get right. Well, with this recipe, you can’t go wrong. My salmon smelled pretty fishy after I thawed it. It seems like frozen fish always does. So, I created this recipe out of my desire to make sure it tasted good. The key is to marinade the fish in a citrus type of base, then slather it in a high-flavor sauce, like dijon mustard. Oh, and we can’t forget these crispy and light panko crumbs. They make it so crunchy and yummy. Much different than traditional bread crumbs. Lastly, you need a little butter in the pan to get it brown and bring out that buttery taste. In a large ziploc bag, combine orange juice and salmon. Let it sit for 20 minutes. Remove and slather with dijon mustard, be very liberal with it. 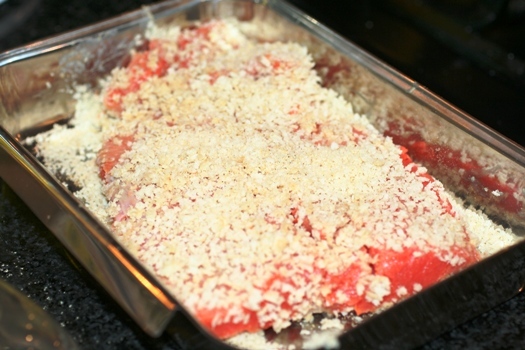 In a 1-2 inch deep dish, combine panko crumbs, ginger, garlic powder, salt and powder. 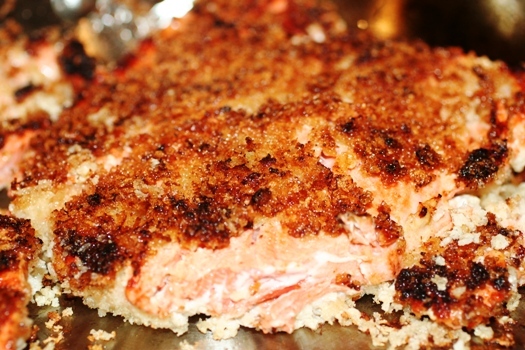 Coat salmon in crumbs until every inch is covered. Heat a large skillet on medium heat, melt butter and add oil, once melted add salmon and cook until golden brown around 4 minutes, then turn over and cook another 3-4 minutes. Serve over greens and drizzle with Asian Sesame Dressing. The salmon looks delicious! My question is about your greens – what kind are they in the picture and how did you prepare them? I’m asking because this dish is VERY similar to a much more expensive favorite of mine at one of our favorite restaurants. I’ve been trying to get the greens the way they did and can’t figure it out! Any hints you have would be much appreciated – thanks so much! 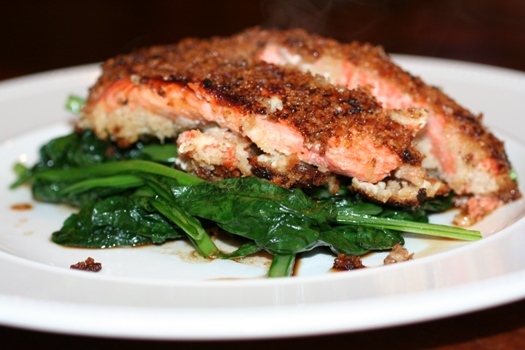 Just made this for dinner tonight using steelhead – delicious! This looks FABULOUS!!! 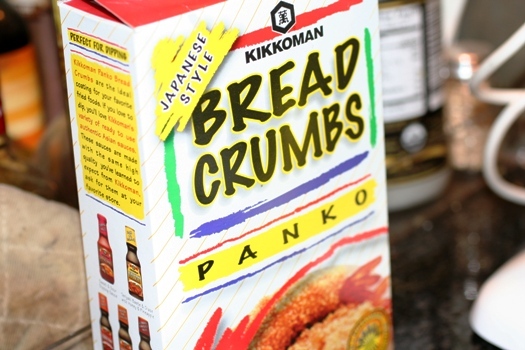 I love that brand of Panko Crumbs! We will be having this soon! !